In this last part of the series IPv6 for pen testers we will now cover how address autoconfiguration works without the need for a central DHCP server. I really encourage you to read part 1, 2 and 3 of this series as they cover the IPv6 fundamentals needed to understand the following paragraphs. 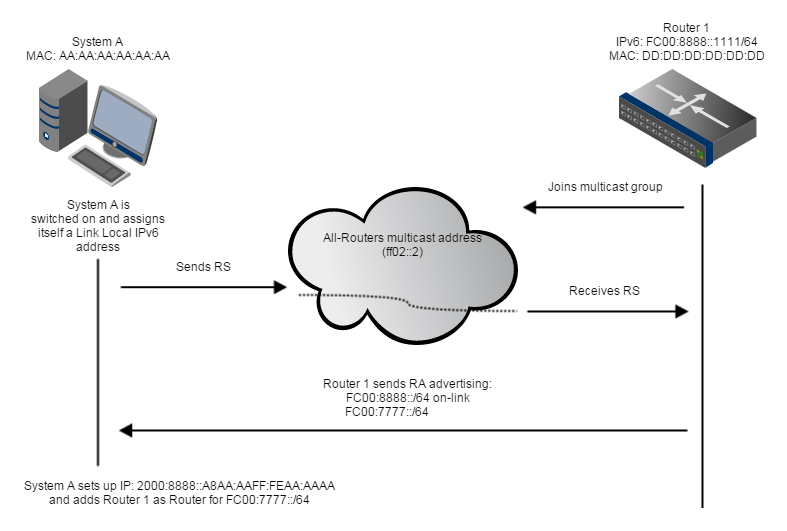 In IPv6 all routers on a network join the so called All-Routers multicast address FF02::2. This group is then used to periodically advertise all available on-link network prefixes and all routable destinations. However as it takes up to two minutes to receive all information a recently booted system can trigger a full re-advertisement of all prefixes by sending a Router Solicitation message to the All-Routers multicast group. After that all routers directly reply with Router Advertisement messages with all on-link and all routable destinations. As already mentioned the client than adds a new IPv6 address for each prefix by appending its EUI-64 host ID. This process allows a client to join a network without any prior configuration. If it is necessary to provide more information to the clients (like DNS servers) the special “Other configuration” bit can be set in the Router Advertisement message. It indicates that other configuration information is available via DHCPv6. This type of DHCP server is called stateless because it only hand out static configuration and does not track its clients. Beyond using Stateless Address Autoconfiguration (SLAAC), as this process is called, it is still possible to use a fully featured DHCPv6 server instead. A pen tester specific IPv6 technique was discovered by Sam Bowne, a well known IT security expert. He developed a Denial of Service exploit for all up-to-date operating systems (Linux, Windows and OS X) based on Router Advertisement messages. It works by flooding the network with new route advertisements that get processed by the attacked clients. During this processing the systems get practically unusable. Sam captured several videos to showcase the result of the flood on this website. Although already standardized in 1998 IPv6 still has not fully reached the end customers. Only very few ISPs in Europe by default even provide IPv6 address to their customers and even less companies use IPv6 within their networks. However as IPv4 addresses will eventually run out in the not too distant future companies have to prepare their equitement and train their employees. This is especially important as virtually every new network component is IPv6 capable and most of them even have it pre-enabled. As we have learned in this series IPv6 introduces many new concepts and some of them can be misused. I currently advise everyone to disable the IPv6 stack on their network components if not used and I highly recommened companies to train their administrators so that they know how IPv6 works and what challenges it brings with it.